The second week has been described as the easiest of the Giro d’Italia and it is certainly true that the first four days will be all about survival for the GC riders. However, stage 11 could turn into another very hard affair as a very tough start and tricky finishing circuit means that the stage has been marked out as a perfect opportunity for a breakaway and so it will be a huge fight to join the right escape in what should be a brutal first hour of the race. The journey towards the mountains in the north continues at the midpoint of the race but unlike in the previous stage, the sprinters won’t get an easy ride along the coast. Instead, the riders will head into the hills for a lumpy, tough ride that has very little flat roads and is a very typical Giro d’Italia stage. Like many of the other moderately hilly stages in this year’s Giro, stage 11 is a pretty short affair over just 153km that brings the riders from Forli to Imola and a finish on the famous Autodromo in the city. The stage is short, yet quite challenging, marked by 5 short but hard-going climbs before entering the final circuit (the Tre Monti circuit), to be covered three times. The route takes in these climbs one after another, and never flattens out: Trebbio (category 3, 6.3km, 6.3%, max. 11%, hardest at the bottom), Monte Casale (with a first section of 10.1% before it levels out in the second half), La Valletta (a 2.7km ascent with an average gradient of 9.8% and a maximum of 14% at the midpoint), Monte Albano (a 4.6km climb with a constant gradient of 6-7%) and Valico del Prugno (category 3, 5.6km, 6.2%m max. 9%, very regular). Then it reaches the Imola racetrack and enters the final circuit at the exit point of the “Variante Alta” chicane. The final 15.4km circuit is raced partly on the Imola racetrack, and partly outside it. From the finish line (on the pit straight), the route covers around 3.5 km of the track, up to the “Variante Alta”. Here the stage course leaves the racetrack (bottleneck), takes the climb leading to Tre Monti (category 4, 4.4km, 4.1%, max. 10%, KOM points will be awarded upon the third pass over the summit) then descends onto quite wide and well-paved roads until the last km, that leads to the entry point of the Rivazza turn, around 850 m before the finish. The route features one last bend 650 m from the finish, and a long, slightly bent home straight on an 8-m wide, perfectly level tarmac surface. In general, there aren’t many technical challenges in the final part of the course. The climb on the finishing circuit has a tough start with 1500m of 6-9% before it becomes almost completely flat. Finally, the final 600m average round 7%. Imola has hosted a stage finish twice in the past, most recently in 1992 when Pagnin won the stage. The riders had summer-like conditions for today’s stage and until now they have only had very little rain. However, tomorrow could be another slightly wet day for the peloton as it will be cloudy all day and there will be a risk of showers. However, most of them will probably come in the morning and with a late start to the short stage, the riders will probably get to Imola in dry conditions. The temperature will reach a maximum of 23 degrees. There will be a moderate wind from a southwesterly direction. This means that the riders will have a headwind until the hit the bottom of the Passo del Trebio where they will run into a crosswind. After the descent from the Valico del Prugno, they will have a tailwind until they get to the finishing circuit. Here there will be a cross-headwind on the climb and a cross-tailwind on the descent. They will gradually turn into a cross-headwind for the finishing straight. The second week has been described as relatively easy and it is certainly true that the first four days of this block will be all about survival for the GC riders. However, as today’s stage proved to Richie Porte, even the easiest day could turn into a disaster and there is definitely no guarantee that we will have status quo among the favourites by the time we get to the next big battle in Saturday’s time trial. Like Porte, the sprinters will be frustrated by the outcome of today’s stage. They only have six chances in this race and today was definitely a missed opportunity. The tailwind turned out to make a very big difference and as Lotto Soudal were the only ones to really commit their full team to the chase, the escapees stayed clear. We were surprised that Lampre-Merida did nothing and that Giant-Alpecin and Trek only used two riders for the chase and saved the rest for the lead-out. The sprinters will now have to take a back seat until Friday as the next two stages are not for them. Among the four first stages of the second week, tomorrow’s stage 11 is definitely the hardest. The first half is extremely tough and if those climbs had been located closer to the finish, it would have been the perfect terrain for Astana to go on the attack. However, the second half is significantly easier and even though the finishing circuit is far from being flat, it is not a place to make a difference for the best climbers. Hence, the Kazakh team will probably keep their powder dry and the GC riders will just try to get safely through the day. However, this stage could still turn out to be one of the hardest of the entire race. As said, the start is one of the toughest of the race and with the lumpy finishing circuit, the pure sprinters won’t be in contention for this one. Hence, everybody knows that this could be a day for a breakaway and so we can expect a frantic start to the stage, much similar to the one we had in stage 9. Lots of riders will be keen to attack and several riders will be sent out the back door in what is likely to be a very fast first hour. Due to the very difficult terrain, it is not anybody’s choice whether they want to be in the break. On these climbs, only very good climbers have a chance and so we are likely to see a very strong break. Tinkoff-Saxo will again have to do a lot of work to keep the situation under control in the first part of the race. A few days ago Alberto Contador hinted that he was willing to give away the jersey for a few days. However, his sports director Lars Michaelsen has told Danish TV2 that the Spaniard is actually intent on keeping the jersey. It is no secret that he is proud of the statistic of never having lost a leader’s jersey in the grand tour and he seems to be keen on keeping that streak alive. This means that the Russian team will have to be very attentive in the first part of the stage and it makes it less likely that riders who are close on GC will make it into the group. The other team that may try to control the situation is Orica-GreenEDGE. This stage is very good for Michael Matthews as he is probably the only sprinter who has a genuine chance in this kind of stage. Today he decided not to do the sprint as he wanted to be ready for stage 11 and there is no doubt that this stage is a big goal. However, it will be virtually impossible for a team like Orica-GreenEDGE to control this stage and so they will probably try to ride aggressively. Riders like Simon Clarke, Simon Gerrans, Pieter Weening and Esteban Chaves will be free to join the break and only if they miss the move will they try to bring it back together. The same can be said for BMC who have Philippe Gilbert but the Belgian will also be very focused on stage 12 and so they will probably just let the break stay away if they miss the move. We only believe that Orica-GreenEDGE and maybe Trek will really do something to bring the break back and they will only do so if they miss the move. With a strong group likely to get clear and none of those teams being very strong in this terrain, it will be impossible to bring the break back if they cooperate decently. Hence, the most likely outcome is that it will be a day for a break even if a sprint from a reduced peloton cannot be completely ruled out. As said, the hard terrain means that only very strong riders will have a chance to get into the break so we have to look to some good climbers to find the winner of the stage. However, the finishing straight is not too difficult so it will definitely not be a disadvantage to have a fast sprint if one wants to turn it into a win. One of the riders who have marked this stage out as maybe his biggest objective of the entire race, is Simon Gerrans. The Australian is still in search of that elusive win that would make up for his many disappointments in the first part of the year and this stage could be his biggest opportunity. As a former Liege-Bastogne-Liege winner, he is perfectly suited to this kind of terrain and as said, we expect Orica-GreenEDGE to have an aggressive approach to the stage. Gerrans is not a pure climber and there is a risk that the first part of the stage is a bit too hard for him. However, if he makes it into the right group, he will be hard to beat on the finishing circuit. Of the riders who can make it into the break in this kind of start, he is the fastest and he is very strong on a climb like the one on the finishing circuit. Furthermore, he is a great descender. His biggest challenge will be to keep it together for a sprint from the breakaway but he may even have a rider like Simon Clarke, Pieter Weening or Esteban Chaves at his side. If that’s the case, Gerrans will be virtually impossible to beat and so he is our stage winner pick for tomorrow. Another rider who is perfectly suited to this stage is Philippe Gilbert who seems to be in pretty good condition. Compared to Gerrans, he is the better climber but he is not as fast in a sprint. Nonetheless, he is still very fast on the line and only a select few riders will have a chance to beat him in this kind of finale. Even if it comes down to a sprint from a reduced peloton, he has a chance as he will surely try his hand in this kind of finale. In a flat sprint, it will be hard to beat Michael Matthews but with Damiano Caruso to do the lead-out, it may not be completely impossible. In case of a sprint, Michael Matthews is of course the obvious favourite. The first part of the course I probably too hard for him to go on the attack but he should be able to survive and be ready to sprint on the finishing circuit. The climb in the finale will be no challenge for the Australian who even finished with the riders like Rigoberto Uran in stage 9. This speaks volumens about his climbing abilities so there is virtually no chance that he won’t get to the finish with the peloton. In a sprint, he will have Gerrans to lead him out and then it is hard to imagine that anyone will be able to beat him. His biggest rival in a sprint finish will probably be Fabio Felline. In the Vuelta al Pais Vasco, the Italian proved that he has the speed to beat Matthews in a flat sprint and this stage suits him really well. Felline has improved his climbing immensely and he is climbing even better than Matthews. His main disadvantage is the fact that he will probably be isolated in the finale and that will make it hard against a well-drilled Orica-GreenEDGE machine. However, the sprint is not his only option. He is definitely strong enough to join a break and if he makes it into the right group, he will be a clear favourite. Diego Ulissi may have his eyes fixed on stage 12 and so there is a chance that he will take it a bit easy tomorrow. On the other hand, stage 11 is also perfectly suit to his skills as an Ardennes specialist and it would be stupid not to try to get into the break. He is not fast enough to win a sprint from a reduced peloton in a flat finale but if he joins the right move, he should be one of the fastest, making him a very good stage winner pick. The same goes for his teammate Jan Polanc who is finally starting to show the full extent of his potential. The young Slovenian has already won a stage but it is definitely not impossible for him to take a second one. He is climbing excellently well and even stayed with the favourites for a very long time in the summit finish on stage 8. He has a very good chance of joining the right break and as he is also very fast in a sprint, this stage is good for him. There is no chance that Movistar won’t have a rider in the break that goes away but the big question is which rider will make it. Their best card is probably Jesus Herrada as he is not well-placed on GC and has the speed to finish it off in this kind of race. He rode strongly in stage 9 where he made it into the right break before sprinting to fifth so the shape is definitely there. Simon Clarke is another very good Orica-GreenEDGE card in this stage. The Australian has been riding very well in this race and he will be keen to get into the right break. The first part may be a bit too tough for him but it will definitely not be impossible for him to make it. As he is fast in a sprint, the finale suits him well. Francesco Gavazzi is in a similar position. He is a solid climber who may find the first part a bit too tough, but there is a chance that he will be able to make it into the right break. 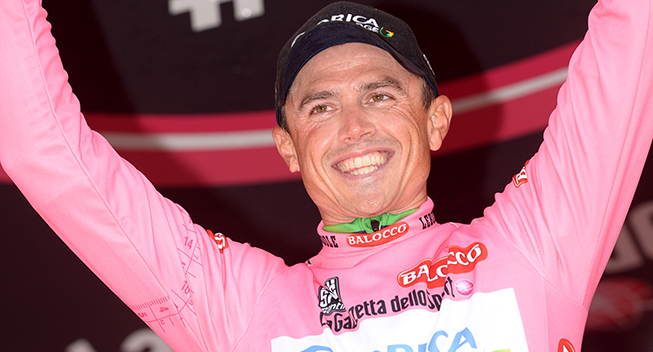 The Italian is fast in a sprint and a great descender so the stage suits him very well. Furthermore, he will have a chance if it comes down to a sprint from a reduced peloton. Simon Geschke is gradually finding his form after he broke his collarbone in the Tirreno-Adriatico. He finished third in the hard stage 9 which shows that he is finally getting there and as the mountains jersey is now a goal for him, it may be a good idea for him to go on the attack tomorrow. Again the start may be a bit too tough for him but as he made it into the break two days ago, he is clearly riding well and he has a good sprint too. Tom-Jelte Slagter shares many of the same characteristics and after a bad start to the year he is finding his form. He got very close to a stage win two days ago and he will keen to try again. He is fast in a sprint and is strong on shorter climbs and so this stage is a good opportunity for him. Already before the race, we claimed that Carlos Betancur would be flying in the final week. He is not flying yet but he is getting there. He has already hit the break twice which proves that his form is not too bad and he will be ready to try again tomorrow. He has a decent kick in a sprint and this could make this stage one for him. Mauro Finetto has not had his best season but in this race his legs are coming around. He has already been on the attack on a few occasions and he seems to be climbing very strongly. Like most of our stage winner picks, he has a fast sprint which makes him suited to thus stage. Stefano Pirazzi seems to be climbing better than ever but until now he has not had much success. Tomorrow he will again try to join the breakaway and he is definitely strong enough to make. His disadvantage is the fact that he has no sprint that will allow him to finish it off. Instead, his teammate Enrico Barbin could be a good option. The Italian is riding very well and unlike Pirazzi, he is fast in a sprint. In case, it comes down to a reduced sprint, Bardiani will look to Sonny Colbrelli who finally seems to be finding his legs. Among the sprinters, Juan Jose Lobato is the one who has the best chance in this kind of stage. On paper, he is even faster than Matthews but he is not very good at positioning himself. However, he doesn’t seem to be climbing very well at the moment and so we doubt that he will be there at the finish. A surprise could come from sprinter Davide Appollonio who is a decent climb and seems to be very strong at the moment.